This isn't the first time I've written about this particular shirt (incidentally, I had also written about the France Techfit shirt previously, here) and it’s often interesting how time passing alters the way we feel about a design. Please don’t misunderstand me; I still love the Athletic Club 2011-12 Away shirt as much as I did when it was released, and became iconic in double-quick time. The difference is the context: back then I was enamoured with the fashion for football shirts with some kind of a chest band/stripe, but hindsight tells us this was little more than a fad. The Athletic shirt, on the other hand, has stood the test of years passed. The twin stripe effect of the Umbro template is undoubtedly striking. The red and white on a green base immediately brings to mind the Basque Country’s ikurrina, which proportionally-speaking it has no right to. The colour combination could just as easily evoke memories of Christmas time, but somehow the desired effect is achieved. 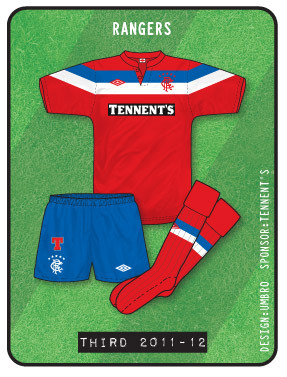 Indeed, the same template was carried by Scottish club Rangers in their last season before their liquidation, and if it is to follow that their equivalent styling was based on the British Union Flag then it failed. Sometimes, we must deduce, a template is exactly what a particular palette and crest have been waiting for, and, along with the local sponsor(‘s logo) and the local governmental leaf patch on the sleeve, this shirt is a great example of such a thing. 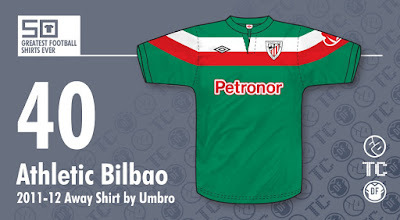 This shirt appeared during Umbro’s most recent golden era and sold out very quickly - you’ll struggle to find even second hand examples today - so has certain hipster credentials. And deservedly so, but that is not to say its rarity is the draw; the shirt is a masterpiece from its neat granddad collar right down to the “Tailored By” hem insert along the side. Of course a certain victory at Old Trafford - where black shorts and socks provided a further pleasing twist - will elevate this shirt’s historical impact even further, but putting this aside, and even the nationalistic Basque connotations of the colouring, this design is neat and tidy as well as being adequately striking, and remains a classic even in the midst of Athletic’s waning cachet.